TAP-NY met with Lin to learn more about his background, his thoughts on writing, and his latest work. Can you tell us about your latest novel, Incensed? 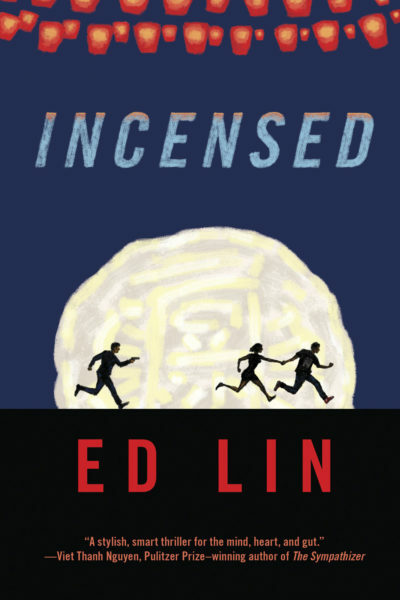 Incensed is the sequel to the first book, Ghost Month. It’s very timely in that it discusses LGBTQ issues in Taiwan while in the convention of a mystery set during the Mid Autumn Festival, when family is traditionally together–the Taiwan take on it is eating barbecue together and going into the country to see the full moon, which symbolizes the family together. I’m trying to explore Taiwanese history and culture. Each book is centered on a different holiday in Taiwan. The country has so much to offer the world. Other island nations, such as Ireland and Jamaica, have made their story well-known globally but Taiwan hasn’t bridged that gap yet.I remember reading an interview with the director Wei Te-sheng and he said that Taiwan has never been the lead character in its own story. That’s something I want to do. What role does Taiwan play in your identity both personally and as an author? Taiwan has occupied a gray area in the history of East Asia, between the major powers of China and Japan. It continues to assert its own identity. I feel that many Asian Americans can relate to that situation. We are not well-represented in mass media and the general public has preconceived notions about us in the same sense that they also think Taiwan is a wayward province of China. It’s even more pronounced an issue for Taiwanese Americans. As an author, I am always on the side of the underdogs, the overlooked. How did you get started with writing, and how did you get to where you are today with 6 books published? I’ve wanted to write since I learned how to write words. I took writing classes through college. I don’t have an MFA, but I was lucky enough to join the Asian American Writers’ Workshop back in 1992. The classes I’ve taken there over the years were my MFA program. One day, I attended a panel called, “How to Get Your Book Published.” I met Kaya editor Sunyoung Lee there and told her I had a crazy manuscript and could she read it? Kaya ended up publishing my first two books, and then it was off to the races, so to speak. What motivates you to write? Who, or what, do you write for? I’m incredibly motivated to write. If I have an idea for a short story I have to write the whole thing down to get it out of my head. The books are a little different because they require patience to write as they take longer to but I’m lucky in that I’ve never felt writer’s block or that I had no idea where to go next in a story. The characters pull me along. I really write for me with little regard for what people want to read. If they’re into it, then great. I would say right off the bat that writing and publishing are completely different things. Writing, the act of getting that book done and making it as good as you can, is the art. Publishing, which is getting an agent or self-publishing, is a business that requires promotion and marketing. Don’t get them confused. Don’t let the publishing aspect dictate what you write. Always love and cherish the writing no matter what. Even if I weren’t being published, I would still be writing. It’s sacred to me and it’s the highest thing I can do. It should be for you, as well.